Observations: Many variations are possible on this walk. Marshall’s Arm was designated a nature reserve. in 1998. 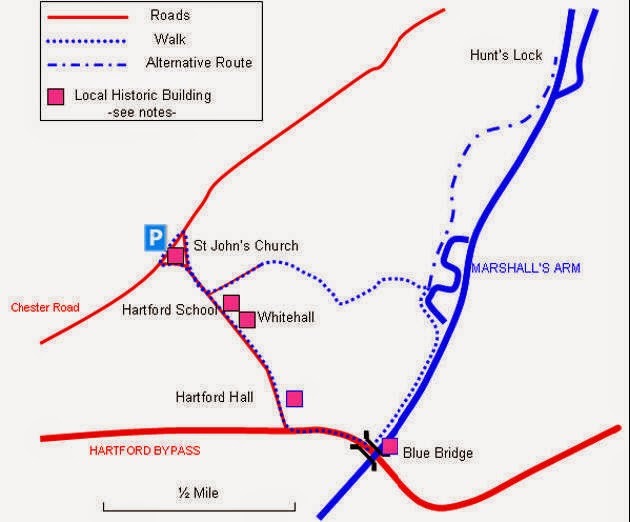 The name of the site comes from the Marshall family, who lived at Hartford Greenbank Manor from the 1700s until the early 1900s. ● From the front of St John’s church walk along Chester Road and turn right at the traffic lights along School Lane. ● Continue along School Lane until you reach Stones Manor Lane on your left and follow it to the end. ● To the right of the school gates there is a path that leads into woodland and the start of the nature reserve. ● The path is clear through the woodland and will bring you out at the river Weaver and Marshall’s Arm. ● Turn right and follow the path alongside the river towards the Blue Bridge. ● Immediately before the bridge take the path up to join the footpath along the Bypass. ● Continue to the traffic lights and turn right into School Lane. ● At the fork in the road bear to the left of the church and continue to meet Chester Road by the Red Lion. ● Turn right to return to your start point. The original church was consecrated in 1824 and was a “Chapel of Ease” linked to the mother church at Witton. It was “a neat brick structure in the gothic style, consisting of nave, north and south transept, with a square tower and clock”. The present church of St. John the Baptist was consecrated in 1875 and is described in Kelly’s Directory of Cheshire 1902 as being “entirely rebuilt in 1875 at a cost of £5,000, an edifice of undressed Derbyshire, Runcorn and Eddisbury stone, consisting of chancel, transepts, clerestoried nave of five bays, aisles, north and south porches and an embattled western tower containing a clock and one bell: the south transept serves as an organ chamber and vestry: the reredos (altar screen), of Caen stone, includes a representation of the Lord's Supper, after Leonardo da Vinci, and the east window is stained : the tower was added, and a clock placed in it, in 1889 at a cost Of £4,000 the church affords 470 sittings. The register dates from the year 1824. The living is a vicarage, net yearly value £234 with house, in the gift of Colonel T. H. Marshall.” The Marshall family were prominent local landowners and were heavily involved in the funding and building of both churches. They gave their name to the Marshall’s Arm nature reserve. This beautiful building and centrepiece of the village and conservation area was designed by the famous Cheshire architect John Douglas and is a Grade II Listed Building. This is a Grade II Listed former Manor House originating in the late 16th/early 17th century. It was remodelled in the 19th century and there are several later additions . It is said to have once been a nunnery and is reputedly haunted by a nun who is buried in the walls of Vale Royal Abbey. It is now a hotel. This is a Grade II Listed Building (as indeed , separately listed, are the front steps!) and dates back to 1835. It is a former villa, now used as offices and was built by John Douglas Senior, father of John Douglas Junior, the famous architect. Once called The White Lion it changed its name when the original Red Lion public house closed. It is one of the older buildings in the village and was the home of the village fire fighting equipment which used to be kept behind the pub (before the days of public emergency services). The old fire bell can still be seen on the wall of the adjacent building—the old off-licence. Founded in 1833 the National School was built by public subscription and a grant of £30 from the National Society. In 1850 it catered for 130 pupils. Although its use has changed several times over the years it is currently used for its original purpose, but now as a nursery school. Designated a Local Nature Reserve in 1998, this unspoilt area extends to 11.4 hectares—The name comes from the Marshall family who lived in Hartford Greenbank Manor from the early 1700s until the early 1900s. They were involved in the salt trade for five generations before the business was sold in the late 1800s. The "Arm" is the old course of the River Weaver that was cut off when, between the 1730s and the end of the century, the river was straightened and locks built in order to allow the passage of larger commercial barges. The size of craft that could be accommodated can be judged by looking at the dual lock system that was built. At each level change there are a pair of locks - one large and one smaller - if you take the optional extension to Hunt’s Lock you will see a good example. The spurs of woodland that lead down to the river are ancient woodland that has never been cleared due to the steepness of the land. They were probably originally part of the Royal Forest of Mara which dates back to the Norman conquest. The reserve comprises woodland, wetlands and meadows and provides a sanctuary for a diversity of wildlife on the urban fringe. Oak, ash, beech, alder and sycamores stand above holly, hawthorn and willow. Ground flora includes bluebells, dogs mercury and ransoms. Birds include jays, blackcaps and wrens and there are holly blue and speckled wood butterflies. The grasslands and meadows are home to amber snails, marsh damselbug and fen spiders. The old narrow stone single span bridge over the Weaver at Hartford was replaced in 1938 by the modern "Blue Bridge" in order to make it easier for boats to navigate the river and to let road traffic bypass Northwich. The book "Images of England - Northwich" reports that the central steel section was designed to be lifted ten feet in case tall vessels needed to pass. If this was indeed so, there are no remaining signs of the lifting mechanism.